CRIME, GUNS, AND VIDEOTAPE: Belgium Star, Noemi Schlosser Shines Over Chicago! Belgium Star, Noemi Schlosser Shines Over Chicago! Los Angeles, CA—Most of my blog visitors know that beyond my day job as a PI and investigative TV news Producer, I’m also an actor. Somehow I developed a new friend on Facebook who is a gifted actress/comedienne fresh from Antwerp, Belgium. Noemi Schlosser has recently been in some projects put up in Chicago’s Lincoln Avenue Theater District. I was hoping to grab an interview from this gal in Chicago but it just didn’t happen. The good news is she paid a visit to Hollywood and I snagged an exclusive interview with the stunning thespian. Additionally I had the good fortune to show her around town. I took her to places like Marilyn Monroe’s grave, The Screen Actor’s Guild and the Los Angeles Art Museum for an entire day. Any time spent with a stunning woman who’s half my age is indeed quality time! Noemi is working out the details for a performance at Chicago’s Palmer House as I write this. I predict big things for this gal that you all will be seeing and hearing about in the future. 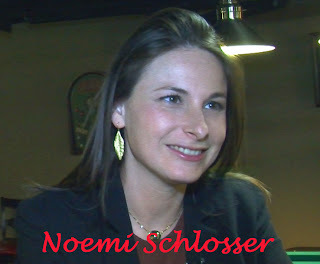 Sit back and check out the exclusive interview Noemi granted to Crimefile News at the Los Angeles Bat Cave. Paul, she's a hot lady! Wow! How'd you get her to sit still for an interview? I will have to see whatever she's doing in Chicago! Thanks for bringing her to us! Wow, she is an exceptionally beautiful woman. You are a lucky man to have spent the afternoon in her company. She is mesmerizing. I also look forward to watching her hit the big time and wish her all the best.